Cindy has worked in the insurance industry for over 35 years. Cindy has been with Chartered Financial Services working as a Marketing Associate since 2001. 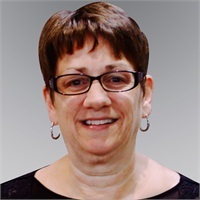 As our receptionist, Cindy also handles customer service requests for Automobile, Homeowner, Umbrella and Life Insurance, and provides quotes for Automobile, Homeowner and Umbrella Insurance. Cindy began her career with Prudential in the fall of 1981 as a Customer Service Representative. She advanced to office management in 1984, and then to Agency Administrator. While raising a family, she continued working part-time with Prudential as an Associate Manager in the Policy Relations Department and at the 24/7 Command Call Center. During her Prudential and Chartered Financial Services tenure, Cindy has earned numerous awards: two Quality Service Awards in recognition of outstanding quality service, and eight Property and Casualty Gold Awards in recognition of her outstanding sales and service performance. Cindy enjoys spending time with her husband, daughter and son. In her free time, she enjoyings going on hikes and reading. Cindy holds a Property and Casualty license in the states of New Jersey and New York. She also holds the LOMA designation of Fellow, Life Management Institute (FLMI) since 1995.